Written nearly in the blink of an eye in June 1922 after Frost had been up all night finishing his long poem “New Hampshire,” the poem, said Frost, came to him nearly in an hallucination in just “a few minutes without strain.” It was published the next year in a collection of Frost poems also titled New Hampshire. It’s likely that you know this beloved poem – and also that you know other Frost poems, such as “After Apple-Picking,” “Birches,” “Nothing Gold Can Stay,” and of course “The Road Not Taken.” The thing about Frost’s poems is that they seem, at first glance, to be so simple, so straightforward. In “Stopping by Woods on a Snowy Evening,” the poem’s speaker is returning home from an errand of some sort on the “darkest evening of the year,” that is, the winter solstice. He and his horse stop by a wood filling with snow. The horse is impatient to get home, but the man is entranced by the snow piling up in the woods, “lovely, dark and deep.” Anyone who has witnessed a deep snow knows the muffled quiet, the hush that descends as the “downy flake[s]” fall, that magical feeling of being transported almost to another world. Since I live in Colorado, I get to enjoy many such snowfalls each year, and I often say it is like being in a snow globe. Perhaps these lines are literally about a busy man who needs to attend to his obligations and not tarry too long in this transcendent landscape. And maybe he is thinking prosaically about the long journey still ahead toward home. But many readers have sensed that there is more at work here. Drawn into the otherworldliness of the dark woods filling up with snow, the speaker may be thinking on another level of the “sweet” relief that death may bring. Like sleep, death is a mystery, an unknowing, potentially a kind of oblivion that seems in some ways attractive to someone, like the poem’s speaker, who is too busy with obligations and errands. Might it be nice to simply succumb to these woods, “lovely, dark and deep” as they are? Then again, maybe this is just a slice-of-life nature poem about appreciating a supremely beautiful winter landscape. A former colleague of mine from my days teaching at West Virginia’s Shepherd University emphatically told students that the poem is not about death as it does not explicitly mention this subject. For that professor, the poem is literally about the narrator needing to get home so he can sleep. But this professor also told students that any given poem has only one meaning and that it is the teacher’s job to ensure that students understand each poem’s single interpretation. To sample a few of the many interpretations Frost’s poem has elicited, visit the University of Illinois’s outstanding Modern American Poetry website, where you’ll find excerpts from a dozen or so scholars. One critic included here, Clint Stevens, writes, “There is in the end the uncertainty in choosing between his death impulse and his desire to continue on the road of life. Which wins in the end, I think I know, but it scarcely matters; the speaker has had his solitary vision; whether he stays or goes, the woods will go with him and the reader, who are now well-acquainted with the coming night.” Well said, Mr. Stevens. Well said. To learn more about Frost, you might want to read the Poetry Foundation’s introduction to Frost’s work and philosophy. If you really want to delve into everything Frost, read Jay Parini’s outstanding biography Robert Frost: A Life – and check out the Robert Frost postage stamp (along with other U.S. stamps dedicated to American poets!). 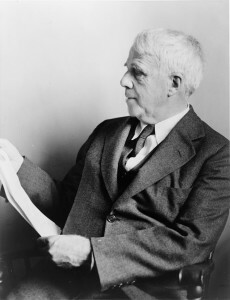 The definitive collection of Frost’s poetry is The Poetry of Robert Frost . Follow the link below to take a few moments to watch Frost recite this marvelous poem. At the very least, hearing him read the words will transport you to a magical, snowy world. And it just might cause you to reflect on the power of life – and death – beyond yourself. And the next time you are lucky enough to enjoy a lovely, deep snowfall, think of Frost’s poems. Happy winter, happy return of the light to all my StoryWeb readers. Your StoryWebs always make me want to read the current selection. I love the atmosphere of a snowfall and I love this poem. I think I’ll just have to get a selection of Frost’s poems and read this again for myself. We’re having a very warm winter so far, but we have miles and miles to go before winter’s over. Thanks for another great read.